Heldric is now out on Steam! I'd like to thank all of you who voted and provided feedback for the game. It wouldn't be possible without your support. Stay awhile and listen, or better yet watch. It’s no small secret that most people don’t like lawyers or accountants. Beside the ludicrous fees they charged per hour, the time required to do seemingly simple requests frustrates me. It shouldn’t come as a surprise that they lump on even more fees and time when dealing with international laws. So I’m very sad to have to report that our release date, once again, has to be delayed a bit more. I’m also sorry it has been so long between developer updates. How about something you want to hear? But fret not my friends, as I have some news that most everyone will enjoy… the story behind the shoemaker. While the wolves were at bay looking for their pound of flesh, I have been working on the intro cut scenes for Heldric. The original plan was to only have 2D static silhouettes slideshow. The extra time has allowed for a proper 3D animated intro complete with multi-scene camera transitions. Have a look and let me know what is your favorite part? I’m rather keen on the hammer bit. The code required to do some of the cut scene required me to intentionally break areas of the AI. It was almost humorous that the AI was being too smart and not doing what I needed. I had to code several custom controllers to force them to behave as expected. It also indirectly lead me to find a few bugs that may have triggered in game in rare cases. Speaking of bugs, squashing them isn’t always the most fun part of developing software. But they just seem to nag at me until I get around to fixing them. The latest change log is very extensive. However, I am going to wait until the game is published before releasing a new demo build. Hopefully the company and legal issues will be resolved soon and Heldric will be in your hands. If not, Heldric will be going after some suits with more than just his shoes. Do you enjoy hack-n-slash but longed for a bit more? Maybe you like tower defense games but find them a bit boring? 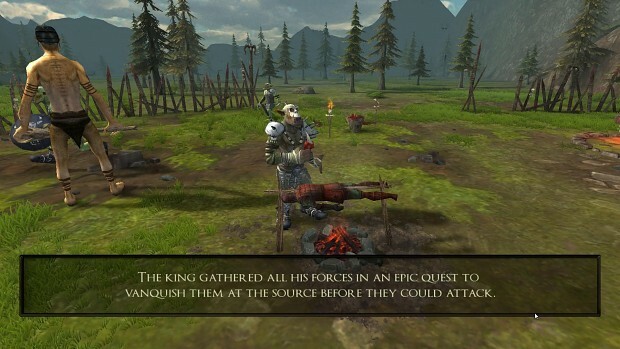 Heldric is a unique mix of the same old styles of game with a few new twists. A hack-n-slash without endless level grinding. A tower defense game with more action. A game where you don't play as an epic hero, but as a humble shoemaker who must work together with his fellow villagers to defend their home. Build and upgrade the village quickly before the attack waves start. Each building you place adds unique abilities to not only the player's character, but your fellow villagers as well. You must choose your structures wisely, as there are only a limited amount of plots to build. Each villager contributes to your coin income and provides essential help in defending the town. You must help defend against waves of monsters intent on killing everyone. Do you have what it takes to survive? Blizzard, get out of Steam ! Great concept! In the trailer, it looks like a unique combination of city simulator, tower defense and RPG. I like the idea that he's a local hero, a regular guy who becomes a leader and so on. The art style is interesting. I'm looking forward to the release on Steam. @lamuerte71, yes there is a demo on indieDB and itch. We are still in the process with steam before but hope to have the demo available on steam as well. seems better than a lot of the other crap releasead. have you played it?is there a demo or something? It doesn't look too bad, and hopefully you won't add any friggn zombies! 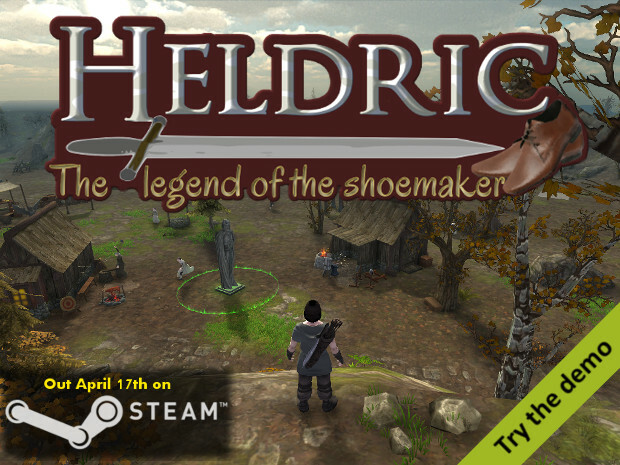 Heldric - The legend of the shoemaker has been Greenlit and is now listed in the Steam store. For the latest information, purchase options, and discussions for Heldric - The legend of the shoemaker, please see it on the Steam Store or in the Steam Community.